Louise Griffin, senior director of research and sponsored programs administration in the office of the senior vice provost for research, received a Myra Kraft Community MVP Award. Louise Griffin, senior director of research and sponsored programs administration in the office of the senior vice provost for research, was honored at Gillette Stadium recently with a Myra Kraft Community MVP Award for her leadership of the Zack’s Team Foundation, which addresses the issue of substance abuse. 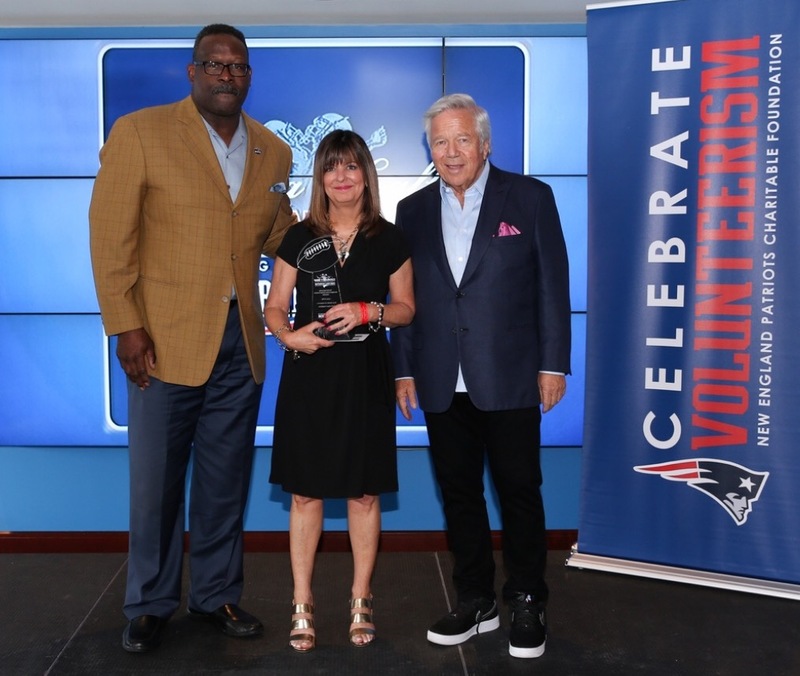 Griffin was among 26 New Englanders to receive the honor from the New England Patriots and team chairman and CEO Robert Kraft. Patriots chairman and CEO Robert Kraft (right) and Patriots and Pro Football Hall of Famer Andre Tippett congratulate Louise Griffin. Photos courtesy of Eric J. Adler/New England Patriots. Griffin launched Zack’s Team in 2014, following the death of her son, Zachary Dennis Gys, from an accidental morphine overdose at the age of 21. The organization operates a sober living home in Portland, Maine, and it is scheduled to open a second location in Lowell, Mass., later this year. Griffin leads a grief support group, speaks at local schools about the dangers of drugs and works with families on preventative measures. Through Zack’s Team, Griffin also has raised funds to help provide scholarships to people battling substance abuse to ensure that they receive the proper treatment; thanks to her volunteer efforts, more than 100 young adults have received treatment and are now living drug-free lives.